Sodalite is traditionally used by crystal healing experts to support mental balance, calmness and inner peace. It’s said to support expressing your thoughts and is therefore also known as the Poet’s Stone. 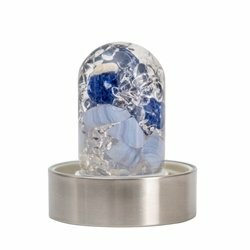 This attribute is wonderfully complemented by blue chalcedony, which is also called the Speaker’s Stone. Wise men (including the great Roman speaker and philosopher Cicero) used it when they carefully had to measure their words. Chalcedony also stands for reflection and meditation. What could be more useful in these hectic times with all its misunderstandings and haste?